EEK! Bill Booth found a 13-foot 9-inch-long and 75-pound python in east Manatee County. 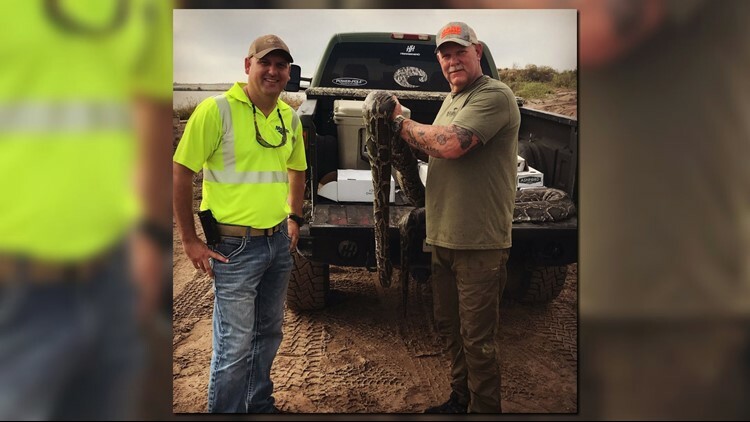 MANATEE COUNTY, Fla.—An Everglades python hunter found some recent work in Tampa Bay. Bill Booth captured a 13-foot 9-inch-long and 75-pound python in east Manatee County. Booth said he had been looking for the large snake, but a truck got to it first and ran it over. In early October the South Florida Water Management District’s Python Elimination Program had taken out more than 1,700 pythons in the Everglades.